Side 1 has 4 'cloudy' faint surface marks, one of these when held in the light has a very slight dip, to look at the record you would never notice it. It has absolutely no impact on play and if it wasnt for this It would be near perfect, Side 1 also has one very faint scratch, Side 2 has No actual marks or scratches, there are some extremely faint marks that would have come from the early inner sleeve (hazy) but these are only really on track 3. Has a Great shine. A Stunning Example of this rare record. PLAYTESTED and it plays Wonderfully, strong and vibrant audio with no lessening in sound quality, no skips, jumps or sticks. Plays with some light static in quiet parts. As mentioned above, the small hardly noticable dip has no impact on audio. This record has been stored for 50 years and will benefit from a proper clean which usually reduces the light static. Earliest Laminated Front/Unlaminated Back 'Stickered' Sleeve has only slight wear. Front has very slight rubbing but is mostly still glossy and clean, a handful of tiny creases from spine edge, a small indentation bump near bottom edge more visabale in the light. No wear to top edge or bottom edge. Opening edge has No wear, crisp and solid. Top left and bottom right corners have a slight bump, other 2 have no wear. Spine is crisp and Fully Readable with no wear, still slightly pinched each end, Back is Super clean with only the very slightest sign of rubbing near top. A Stunning Example of this rare sleeve. Original Red Decca Let It Bleed Inner is a bit creased but clean, No writing, No splits or other damage. Original Poster is Stunning, No wear or creasing, Near Perfect. 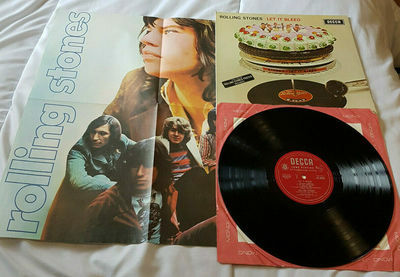 A Mega Rare and Very hard to find LP Complete with Original Poster. THE WHO BY NUMBERS - RARE UK 1975 LIMITED NUMBERED *N-MINT* VINYL LP SUPERB !!! !